Revelers at the Riviera Country Club in the Pacific Palisades hoisted this happy Bar Mitzvah boy high in the air at the post-service party to celebrate his big day. Photographing Jewish celebrations properly involves an expert knowledge of lighting as well as high ladders to ensure that nothing gets missed. 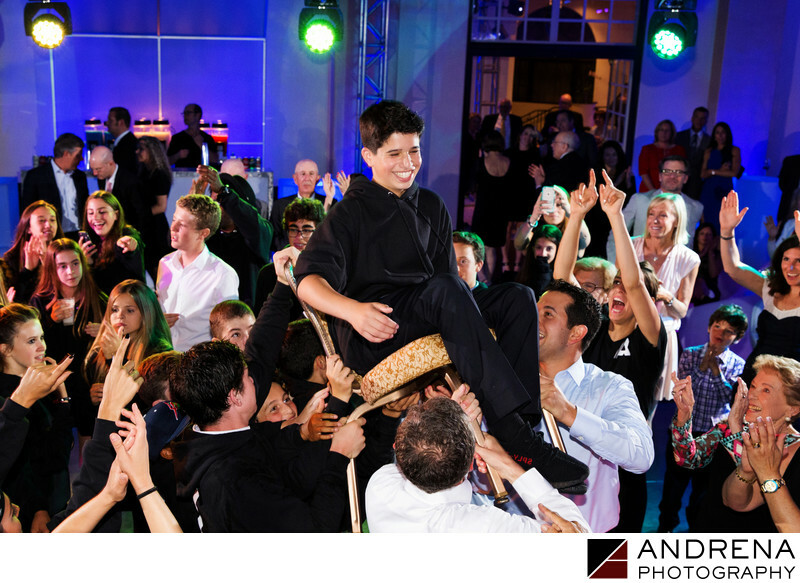 Capturing this Bar Mitzvah boy's one-in-a-million smile from above is well worth toting a special ladder to parties to make sure we have the hora and dancing covered from every angle. It's also hard not feel the joy and love coming from those cheering him on from below. Moments like these really capture what it is to be part of such a loving community, one rooted in so many time-honored traditions. If a temple isn't your style, the Riviera Country Club is a beautiful location to hold a Bar or Bat Mitzvah.